MANY FLY FISHERS cut their teeth on rainbow trout (Oncorhynchus mykiss). Therefore, to read a new history of that fish is both intriguing and unnerving, particularly when the author calls those fish “entirely synthetic.” But Anders Halverson’s An Entirely Synthetic Fish: How Rainbow Trout Beguiled America and Overran the World (Yale University Press, 2010), is hardly a criticism of the fish or the people who love to fish for them. Instead, it is a tale of how well intended programs have gone utterly wrong, putting the treasures of trout anglers at risk, while simultaneously spreading the joy of trout fishing around the globe. The story of the rainbow trout is one of tinkering, and along the way we lost some of the parts. It begins in 1872 on California’s McCloud River, where Spencer Baird, Livingston Stone and the fledgling United States Fish Commission sought to restore America’s dwindling fish stocks, as well as American cultural virility, through the new science of fish culture. According to Halverson, the rainbow trout was an unassuming victor. Its global success resulted from its relatively easy propagation and ability to survive compared with other coldwater game fish. Along the way, propagated rainbows became political bargaining chips for politicians needing to keep their constituents and voters happy, many of whom were sportsmen with political clout. Despite unassuming beginnings, rainbows quickly rose the ranks of sporting preference. They are beautiful, challenging, and put up a good fight. And, if you were to poll anglers today, you would find that many still prefer rainbows to many native trout for all the same reasons. The native home of the rainbow spans the Pacific Rim, from Kamchatka to Mexico. Yet, through the waves of aesthetics, politics, and sporting organizations rainbow trout now swim on every continent, save Antarctica. 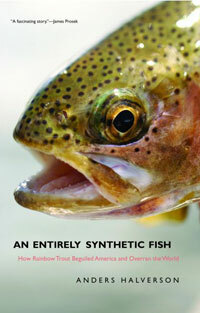 Through repeated propagation rainbow trout have indeed become comparable to a genetically modified food crop. This reality has made them susceptible to parasitic attack from whirling disease (Myxobolus cerebralis), as much as public backlash when anglers and scientists in the 1970s began turning their attention toward wild and native trout and their ecosystems. More recently, as biologist and groups like Trout Unlimited have worked toward the restoration of native species, rainbows have become a victim of their own success. Recently Canadian angler, Adam Konrad, caught a world record forty-three pound rainbow in Saskatchewan. But given the reality of genetic manipulation in an escapee fish containing an extra set of chromosomes, Halverson and others have wondered if this counts as a record trout, or a trout at all? Since Livingston Stone first reared McCloud River rainbow trout in 1879, in a blip of time humans have managed to bypass eons of evolution. In exploring that story, Halverson tells a tale that is as much environmental history as it is American political history. We learn as much about key players like Stone as we do the fish itself, and how it was been steered by cultural values and financial gain, angler preferences and ecological manipulation. As an ecologist Halverson researched an engaging story filled with depth and critical insight and told with the deft skill of an accomplished journalist. Throughout the history of fish and fishing, angling authors have compiled an unprecedented collection of literature. Halverson adds a refreshing and crucial perspective to that history. If you are interested in fishing history, fish biology, or political history this is a must read. Brace yourself, however, it is not always a pleasant tale.